We are the best choice for Niagara Window Caulking. We clean thousands of windows each year as Niagara’s Window Cleaners and the biggest problem we come across is cracked or brittle caulking around the windows. If your caulking is damaged…..
Energy cost are going up everyday (and out your windows & doors through the cracked caulk on the exterior of your home). 2. Water can get through the cracks causing wood damage and mold. Address this asap before it costs you thousands of dollars. You can protect your home by ensuring your caulk sealant is in great condition. 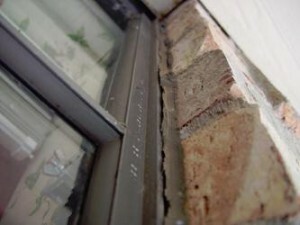 We offer residential home inspection and installation of new caulk sealant on most homes. If you are looking to have your home re-caulked in Niagara then we want to win your business. We begin our Niagara Window Caulking service with the removal of your existing caulking. Backer rod is then installed to ensure that all gaps are insulated properly & to guarantee the proper amount of caulking is applied to the window or door. The window caulking product we install comes with a 55 year warranty for your peace of mind.